Wisconsin based Hedda is another fine example of the 'old school being the new school' in heavy metal, also known in the press as the New Wave of Traditional Heavy Metal. Formed by Jamie Mac (b) and Kent Herman (g), both former members of regional progressive metal band Dimension X, Hedda's self-produced and financed EP The Calm Before more approximates 1980 heavy metal than 2010 trends. Their promotional tag line is 'provocative metal with an epic wall of sound.' Frankly, I think they're being a bit idealistic. Indeed, their arrangements are solid, but there is nothing novel or ingenious here; this is fundamental old school metal. Don't get me wrong here: this is not a bad thing; I dig it. Hedda brings a precision rhythm section, strong vocals, and versatile fret work. All the tunes here are well-crafted and entertaining with major kudos to The Gates and Full Circle. As for the 'epic wall of sound' thing, Hedda needs to revisit their time in the studio. Though I can hear their strength and enthusiasm, their skill and music is muted and flat on this disc. Perhaps the influence or direction of a third party could brighten their next work. All in all, however, I'm a fan of Hedda's rich and fundamental heavy metal. The Calm Before has enjoyed repeated spins at Dangerdog World Headquarters simply because these guys are really good and there's a breadth and depth to their music that overcomes the flaws in production. Recommended! 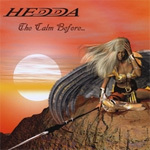 Hedda's debut EP The Calm Before is a solid work of traditional heavy metal. With the exception of production flaws, this is an earnest and entertaining work that also shows Hedda's promise for future accomplishments.